People are on the go more than ever, and they want to take their music with them. So, it's no surprise that portable, battery-powered, Bluetooth speakers are proliferating like crazy. Among them is the new Xtreme 2 from JBL. Let’s find out if it can get the party started during your next outing. 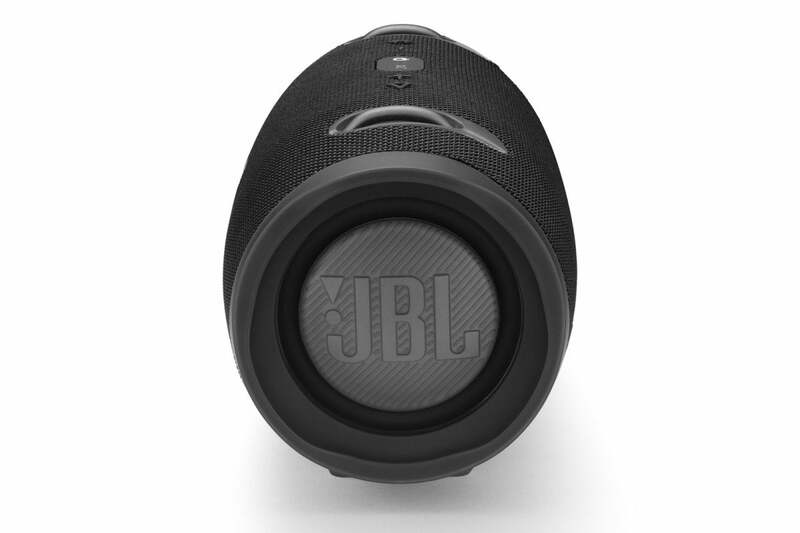 The JBL Xtreme 2 is a nearly cylindrical unit measuring 11.3 x 5.4 x 5.2 inches (width x height x diameter). The extra height is due to the feet that prevent it from rolling around on a flat surface. It tips the scale at a hefty 5.3 pounds, thanks to its sturdy metal construction and tough fabric covering. It comes with a woven nylon strap (with an inline bottle opener, no less!) that lets you sling it over your shoulder. The Xtreme 2 is available in black, dark blue, or forest green. Two 2.75-inch woofers and two 0.8-inch tweeters face forward, and two 3.5-inch passive bass radiators face outward from the ends of the enclosure. The four active drivers are powered by an internal amp that delivers 10 watts to each driver (40W total) when the Xtreme 2 is connected to an AC power outlet. That amp power is reduced somewhat when the unit is being powered by the battery, but JBL won't disclose the amp power in that case. The frequency response is specified to extend from 55Hz to 20kHz, with a signal-to-noise ratio of more than 80dB. The ends of the Xtreme 2 hold 3.5" passive radiators, which give the bass a boost. Bluetooth is the primary way to feed music to the Xtreme 2. It supports Bluetooth 4.2 using several profiles, including A2DP 1.3, AVRCP 1.6, HFP 1.6, and HSP 1.2. Interestingly, two devices can be paired to the speaker at the same time. When one is playing and you start playing from the other one, the speaker switches automatically. I suppose this could cause some confusion if two people want to play something at the same time. In addition, the unit offers a feature called Connect+, which lets it broadcast a Bluetooth signal to as many as 100 other Connect+ devices to spread the music around a much larger area. The transmitter power can reach up to 12.5dBm (0.02W) in a frequency range from 2.402- to 2.480GHz using GFSK, π/4 DQPSK, and 8DPSK modulation. You can also wirelessly connect two Xtreme 2s in a stereo pair. The Xtreme 2 is waterproof as defined by its IPX7 rating. It can survive being immersed in water to a depth of 1 meter for up to 30 minutes, which means it cannot be damaged by splashing water. So go ahead, take it to your next pool or beach party without worrying about getting it wet or even dropping it in the water. JBL doesn’t publish a rating for dust incursion. 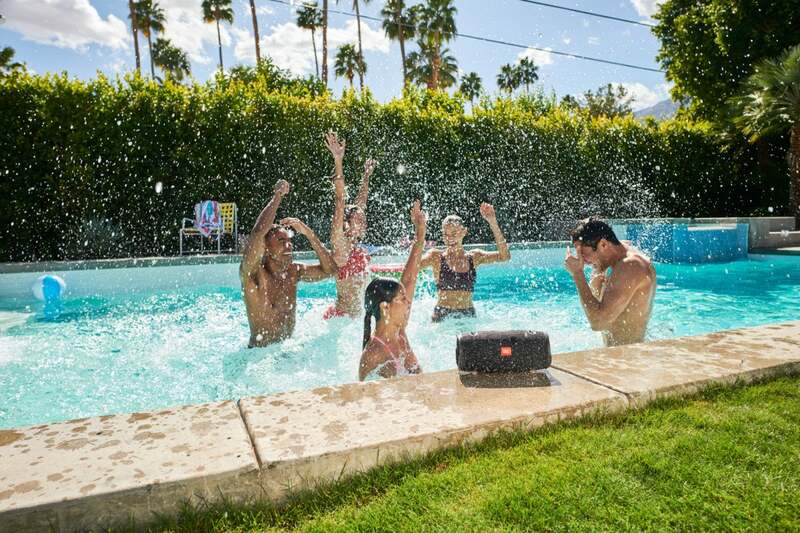 Being waterproof (the speaker carries an IPX7 rating), the Xtreme 2 fits right into any pool party. Finally, the Xtreme 2 can function as a speakerphone with noise and echo cancelling. Simply enable that function in the JBL Connect app and push the play/pause button when you make or receive a call on the paired mobile phone. The controls on the top of the Xtreme 2 are simplicity itself. From left to right, they include buttons for Bluetooth pairing, volume down, power on/off, Connect+ activation, volume up, and play/pause, which also lets you skip to the next track by pushing it twice. Five tiny LEDs located on the front near the bottom of the speaker indicate the battery level when you first turn the unit on. Connections on the back include an analog aux input and a USB port, which can provide up to 5V/2A of power to connected USB devices—though, of course, that will drain the battery faster. A separate Micro-USB port is used for firmware updates, which seems odd, since updates are normally performed using the JBL Connect app on a paired device. An AC power receptacle rounds out the connections, all of which are found behind a tight-fitting rubber cover. Be sure that cover is closed if you think the speaker might be exposed to water. 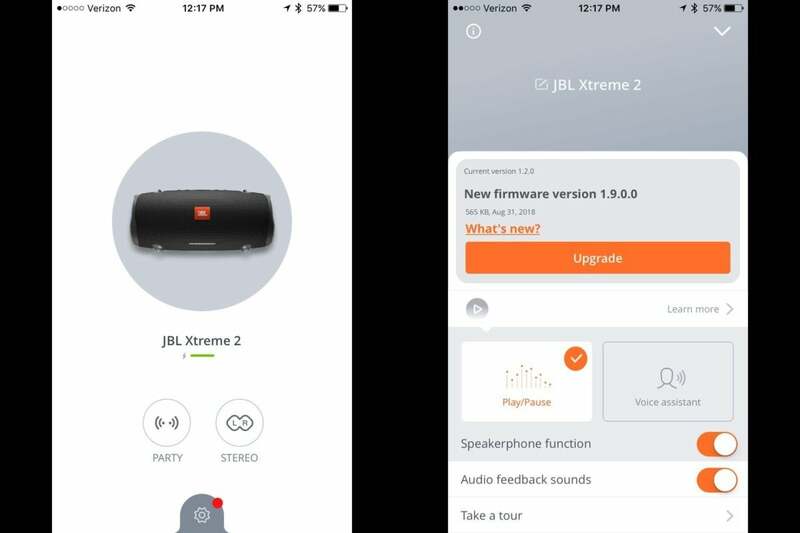 The opening screen of the JBL Connect app (left) lets you engage Party mode (wirelessly connecting multiple speakers) or configure two speakers as a stereo pair. The main screen (right) lets you update the firmware, configure the play/pause button to play and pause the music or activate the voice assistant, enable the speakerphone function, and adjust other settings. The Xtreme 2 even offers voice activation. Once you enable it in the JBL Connect app on a paired device, the play/pause button calls for Siri or Google Assistant on that device. In this case, however, the button does not play or pause the music; you choose one or the other function. Otherwise, the app is used only for speaker configuration (stereo pairing of speakers or Connect+ group) and firmware updates. The Quick Start Guide that comes with the Xtreme 2 is quite small with almost microscopic print in about a dozen languages. Fortunately, most of the guidance is given pictorially, so the tiny type isn't that much of a problem. You can also get the guide online, which lets you enlarge it as needed. Pairing the Xtreme 2 with my iPhone 6 was a snap. After opening the Bluetooth settings on the phone, I pressed the Bluetooth button on the speaker, which caused the power button to flash blue. The first time I tried it, the pairing failed (possibly because my editor had previously paired it with his Android phone before he sent it to me), but it worked the second time, after which the power button was lit steady blue. Enjoy your favorite bottled beverage thanks to the bottle opener on the carrying strap. I've been listening to a lot of symphonic band music lately, so I started with Grainger's “Lincolnshire Posy,” played by Denis Wick and the London Wind Orchestra. The initial volume was so low that I could barely hear anything, but it was fine once I increased the level. The bass was somewhat boomy and overemphasized, especially the tympani and tubas, but otherwise, it sounded pretty good—surprisingly rich for such a small speaker. However, there was virtually no stereo separation, which wasn't so surprising for such a small speaker. Next up was "Good Lava," from Esperanza Spaulding's album Emily's D+Evolution. Esperanza's vocals were quite good—up front and very clean. Also, the bass was much better on this track, well balanced with the rest of the ensemble. In fact, the instruments and vocals all sounded excellent. My wife, Joanna Cazden, is a singer-songwriter with six self-produced albums. I played all the wind parts on her last album, Living Through History, so I know very well what it's supposed to sound like. I listened to "No End to Love," which includes a synthesized woodwind ensemble that I overdubbed playing a Yamaha WX5 wind controller and VL1 wind synthesizer. Overall, the sound seemed a bit closed in, but Joanna's vocals sounded quite good, and the instruments—including acoustic bass and piano—exhibited good definition. The controls are found on top of the speaker, and a row of tiny LEDs at the bottom indicate the battery level. Another album I played on is A Festival of Renaissance Dances, by the Southern California Early Music Consort. "Introduction and Courante" features sackbutts (renaissance trombones), cornett (a hybrid instrument with a trumpet-like mouthpiece and finger holes like a recorder), shawm (renaissance oboe), and large drum. The drum sounded quite boomy, but the instruments were nicely delineated. "Branle" is played on recorders and tambourine, and it sounded sweet on the Xtreme 2. Returning to the present, I played "Cousin Dupree" from Steely Dan's Two Against Nature. The bass was quite boomy, but the drums were very clean. The vocals were good but somewhat overpowered by the bass. As I was listening, I got a text message on my phone, and the incoming-text sound was very loud as it interrupted the playback. When I replied to the message, the keyboard-click sounds were very loud as well, and they were noticeably delayed, which made it much more difficult to thumb type. I disabled the keyboard-click sounds in the iPhone's settings, which solved that problem. I could have disabled the incoming-text sound as well, but I'd rather know when a text arrives. 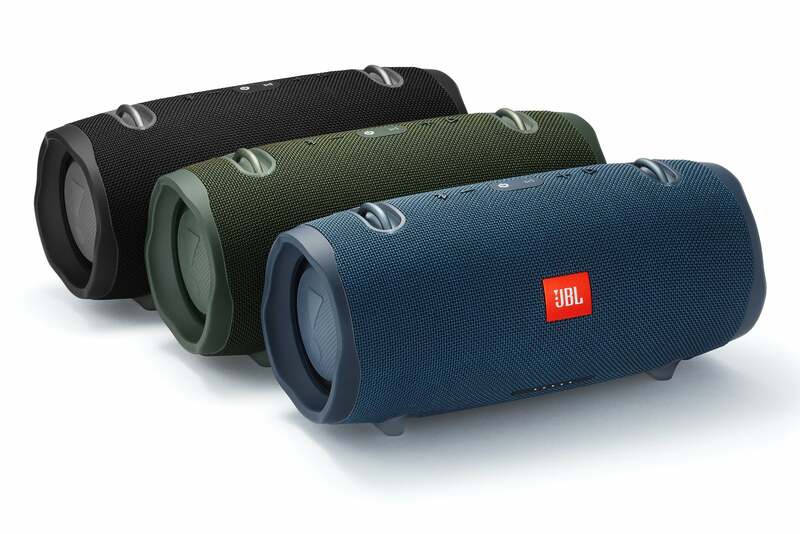 The JBL Extreme 2 is available in a variety of colors. In addition to my iPhone, I also paired the Xtreme 2 with an iPad Mini, which worked fine. But when I returned to the iPhone to do a firmware update, the app wouldn't connect to the speaker. JBL recommended that I quit out of the app, power down the speaker for a minute, and then try again. That worked, but it caused a bit of frustration. The current firmware version was 1.2.0, and the update was 1.9.0.0. I have read user reviews that report degraded sound quality after a firmware update, so I wanted to see if I had a similar experience. The app instructs you to plug in the AC power adaptor and keep the device close to the speaker. After confirming I did that, the update began immediately and took a few minutes to complete. Listening to some of the same selections as before, I noticed no difference in the sound quality. During this test, I also cranked the volume to see if the Xtreme 2 would distort. Amazingly, it didn't, even though it was way too loud for my comfort indoors. Taking it outside, I maxed out the volume: At the highest setting, it dropped the level momentarily before blasting. While I didn't hear distortion per se, the tonal balance did seem to change—the bass couldn't keep up with the mids and highs, making the overall sound thinner and brighter. 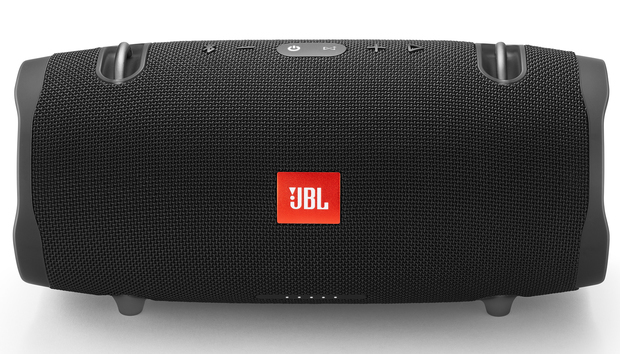 The JBL Xtreme 2 is an excellent portable Bluetooth speaker. Setup is a snap, and it sounds surprisingly good for such a small speaker, though the bass can be quite boomy. I wish the JBL Connect app included EQ (even if only simple treble and bass controls), which would help overcome that problem. The Xtreme 2 exhibits virtually no stereo separation by itself, but you can use two of them as a stereo pair. 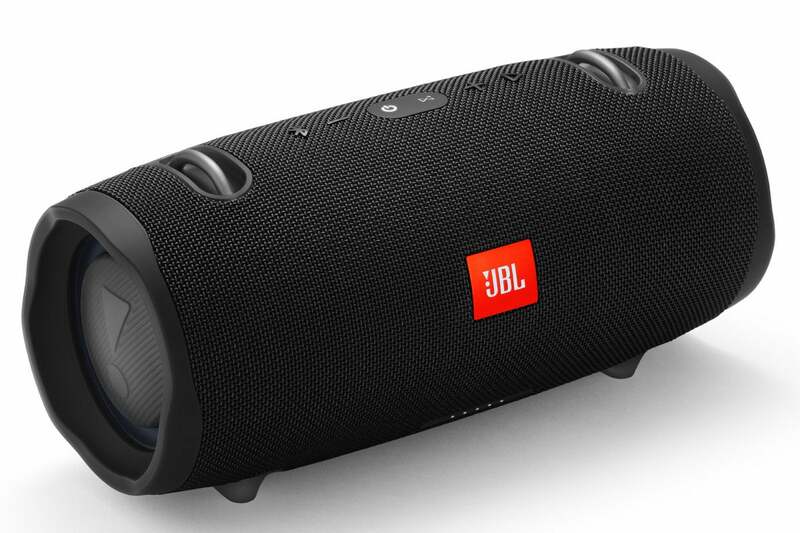 You can also wirelessly connect up to 100 compatible JBL speakers to cover a very large area. Its IPX7 waterproof rating means you don't need to worry about getting it wet or even submerging it entirely. And don't forget the bottle opener on the carrying strap, which makes the waterproof rating even more important! 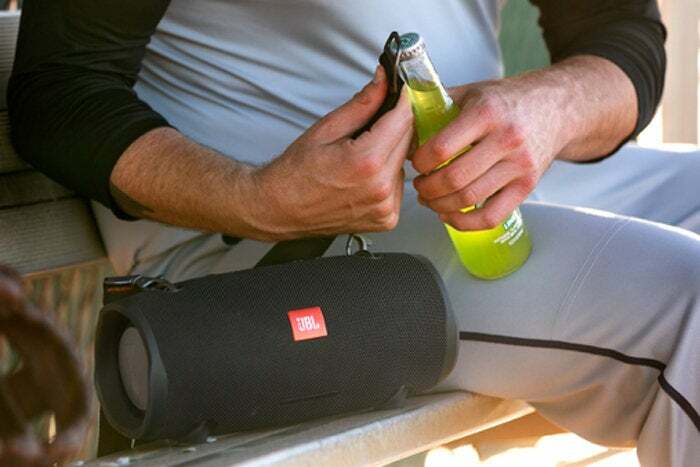 The Xtreme 2 is a great way to bring your favorite tunes to your next party.